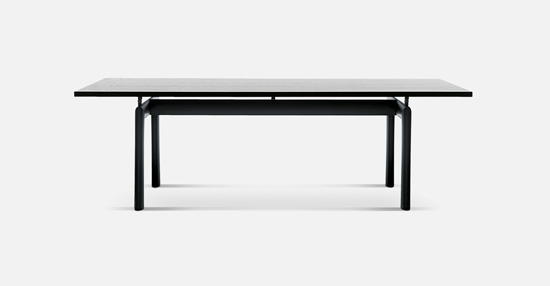 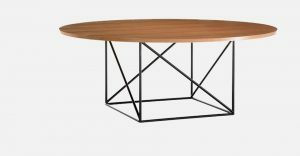 The key idea at the heart of this table is to make a distinction between its load bearing base and the top that was to be supported. 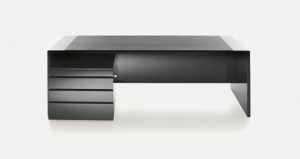 Each piece is completely autonomous and this is highlighted by the addition of the four middle support pieces used to adjust the height and keep the slim rectangular top in place over its the heavy base. 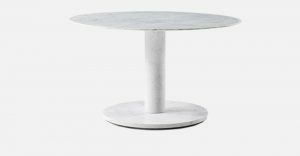 The steel base is enamelled in the Le Corbusier’s colours palette: black, light blue, grey, green, mud and ivory with tops in crystal, textured glass or in the fi nishes natural or black stained oak or American walnut and in white Carrara or black Marquiña marble.